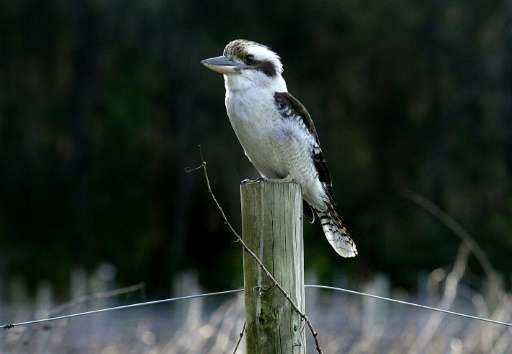 Populations of some of Australia's iconic birds—including the laughing kookaburra, magpie and willie wagtail—are in decline in parts of the country, according to a report released Wednesday, with habitat loss, feral cats and foxes among the likely threats. The State of Australia's Birds report, published by Birdlife Australia, was compiled using data from 420,000 surveys collected by volunteers across the continent since 1998. 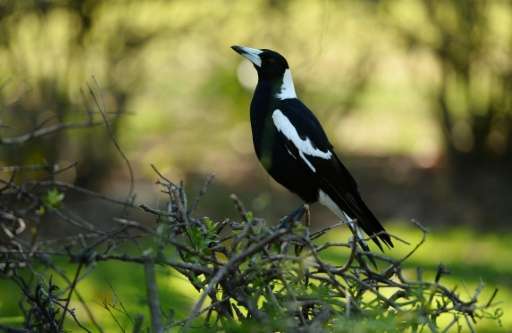 "It's a surprise that common birds that we see everyday like magpies or kookaburras could be in decline," editor of Australian Birdlife Sean Dooley told AFP. "It just goes to show you the value of large-scale, broad-scale systemised surveys because if you were relying on the anecdotal evidence of bird watchers and other people, they'd be saying that, 'no, of course magpies are still common'." The report was supported by the government and two universities. Environment Minister Greg Hunt, who launched the report in Melbourne, said his government was targeting 10 species for "priority action", including the helmeted honeyeater, hooded plover, plains-wanderer and boobook owl. "I want to bring these birds back far enough from the brink to survive in the wild long-term," Hunt said in a statement. "I want future generations to enjoy the colour, movement and song they bring to our lives." The minister pledged Aus$100,000 (US$74,610) towards a project to tackle the 90 percent plunge in plains-wanderer populations since 2001, and another Aus$40,000 to studying two hooded plover sub-populations on the New South Wales state's south coast. Two more birds, the orange-bellied parrot and the western ground parrot, as well as eight others yet to be identified, would also receive special support, Hunt added. Ahead of the Threatened Species Summit in Melbourne on Thursday, Hunt said some of the key factors causing the population declines included habitat loss, feral cats and foxes. Dooley said other causes could also be responsible and the report would strengthen the push to tailor conservation efforts to local threats and species. "The next level we want to take it to is to start to dig into these results and compare with other things, for instance with rainfall or temperature records or the number of feral pests—like cats and foxes, to see if there is correlation between these sorts of trends," he said.